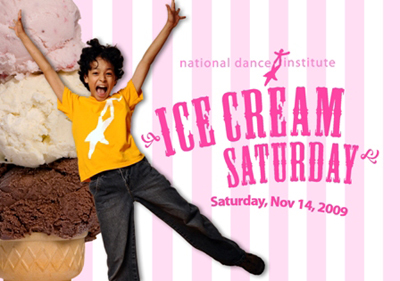 Saturday, November 14, 2009...The entire family is invited to join National Dance Institute (NDI) for an Ice Cream Saturday at Symphony Space, 2537 Broadway at 95th Street. Join NDI for a performance and ice cream party marking the NDI Celebration Team’s return to Symphony Space. The event kicks off with “Take an NDI Class” at 1:00 p.m., an exclusive opportunity for young Ice Cream Saturday audience members to be on the Symphony Space stage and learn some dance moves from a professional NDI teaching artist. At 2:00 p.m., more than 50 NDI Advanced Team dancers, ages nine to15, perform in colorful costumes to lively music, featuring selections from Imagine: A Celebration of John Lennon. Following the performance, a “Gelato Sundae Party” will be held at 3:00 p.m.
National Dance Institute is a not-for-profit organization founded in the belief that the arts have a unique power to engage children and motivate them towards excellence. Proceeds from the event will help provide NDI Advanced Team scholarships for motivated and talented New York City public school children. Tickets are $75 for adults and $35 for children, and must be reserved by November 9th. For more information and to purchase tickets, please call (212) 226-0083 ext. 223, email sschlosser@nationaldance.org or log on to www.nationaldance.org.